Even though I am sighted, I prefer walking with sleep shades on. I get bored just walking, so with a cane in my hand, I have something to do while I’m traveling. Maybe that makes me weird, but thanks to a schedule change, I ended up doing a route for class while on vacation. Most importantly, that routine travel route made an impact on a 13-year-old girl in Georgia. For our quarter break, I went to visit my friend’s parents in the city of Guyton, Georgia. Their neighborhood is stereotypical suburbia: in the middle of nowhere, with multiple cul-de-sacs, a community pool, and nearly every home has the same look and feel. 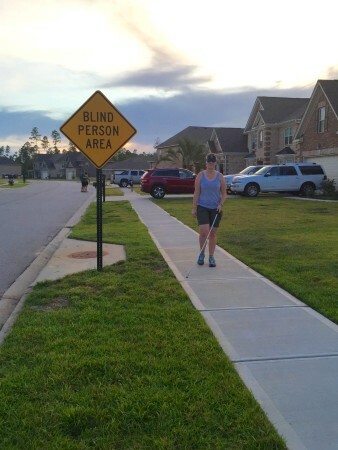 We had been told that a new, and quite strange, sign went up in the neighborhood that read, “Blind person area.” Not wanting to miss the chance for a good photo, Paige and I set out exploring. She acted like an instructor, giving me very little information about the area and walking behind me, and I played the role of student, using my cane and wearing sleep shades. Thanks to the ubiquitous construction sites, the sidewalks were haphazard; they started and stopped abruptly. Now, I’m used to hearing this question in Ruston, Louisiana. 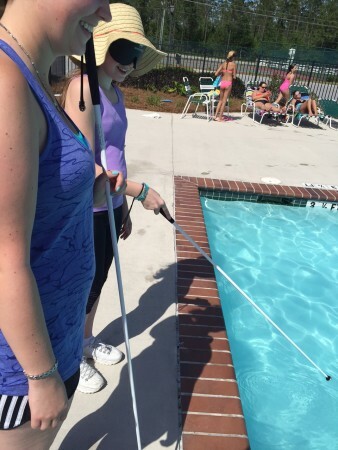 Our little town is home to the Louisiana Center for the Blind and the Institute on Blindness, which trains future teachers of blind students. But here? In suburban Georgia? We told her what we were doing, though we didn’t mention the quest to find this sign. And so begins the story of how we met 13-year-old Makayla, who has retinal blastoma and who’d just undergone some major reconstructive surgery. Her mom, Stephanie, told us that their family had just relocated to the area in November, and her daughter hadn’t yet had an O&M instructor teach her about their neighborhood. Stephanie suggested that we go for a walk together, so I ventured toward their community pool with a future geneticist (Makayla) and a future braille teacher (Paige). Before setting out, Paige and I began looking for articles and information to share with Makayla’s mom about how blind people can live the lives they want, actively participate in science class, read braille, and travel independently. Toting nearly a dozen pages of printed articles, we walked inside Stephanie’s home while Makayla was getting ready. I had brought an extra pair of sleep shades to show Paige’s dad how fun it was to travel with a cane, and Makayla came into the dining room with a folding, Ambutech cane with a marshmallow tip. I looked over to the window—wondering how to explain that I wanted to teach her a new approach to traveling that would give her more tactile feedback and with more advance notice than her current cane—and I spied a straight, fiberglass cane in the corner. As it turns out, Makayla’s O&M instructor had gotten that cane for her at the end of the school year but didn’t have time to teach her to use it. To our delight, Stephanie encouraged her daughter to give the new cane a chance. After walking only a few houses down the street, I was excited; this girl was an excellent traveler with very little instruction! 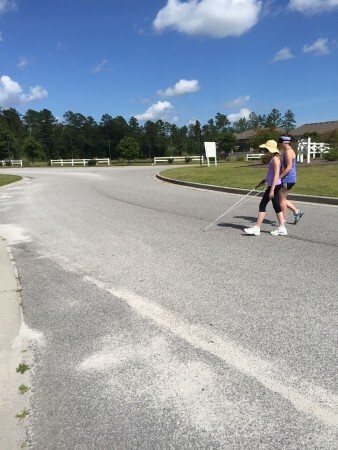 For a teenage girl who hadn’t traveled alone in her own neighborhood before, she knew what streets connected and how she could get to the clubhouse from her home. As we approached the roundabout near the front of her neighborhood, we began to hear a fountain. Makayla instantly recognized the sound of flowing water as a telltale sign that we were nearing the pool, located in the middle of a roundabout. Now we could have walked around the roundabout, but I wanted to show Makayla that the structured discovery cane technique would keep her safe enough to cross straight through the circular road. After successfully crossing, Makayla found the fence around the pool. But this wasn’t good enough for me. I wanted her to find the pool, not just a fence. So, she tapped her cane along the fence until she reached the gate. Again, she thought this was close enough. So we walked through the gate, around the chairs, and up to the edge of the pool, where Makayla swished the water around with her cane. e visited before, yet in the six months that her family had lived in the neighborhood, Makayla had never ventured out on her own. Her sister is always out playing or riding her bike through the neighborhood, but Makayla didn’t know that she could travel on her own to the pool. There is nothing as rewarding as seeing a student’s pure joy and confidence in herself. 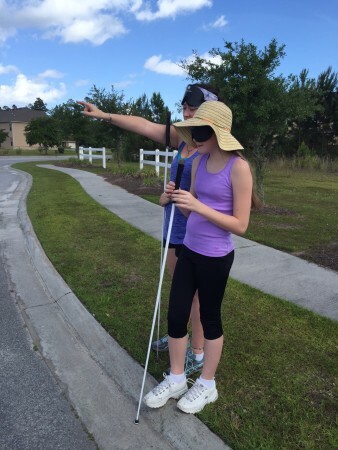 I really believe that with just a little training and encouragement, Makayla’s cane gave her the same freedom that her sighted siblings have had all these years. To be clear, I don’t advocate feeling up cars all over the neighborhood to find your home…but hey, whatever works! Makayla made her way to the front door, opened it, and found her mom on the other side. Stephanie had been watching us come back, but she didn’t want to interrupt Makayla’s travel lesson. I’ve always told parents that if you wouldn’t do something for your sighted children, don’t do it for your blind child either. Her mom already seemed to know this, and she knew that Makayla needed to know that she could leave home and come back all on her own. This is what teaching orientation and mobility to children and adults is all about. We gave Makayla a few pointers, but she did the rest. She already knew how to get around the neighborhood; she just needed to know that she could do it on her own. Oh, and—of course—I got my picture with that new sign.